The bird in the background is ringed, and I photographed it at the same location more than a year ago. In the mean time this bird has spent a summer in the Arctic, maybe in Spitsbergen, and yet come back to winter at this very pier. Birds are cool. 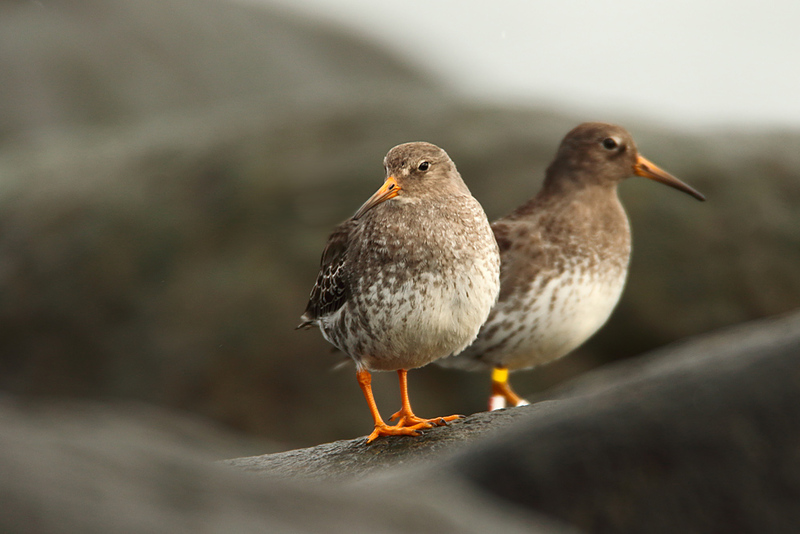 I got a chance to spend a few hours at a location not far from home, hoping to shoot many purple sandpipers. Alas I only ever saw three, and they soon went off elsewhere to play. But there were other birds around, not least a common scoter that gave me an eyeful, and some crested mergansers. The scoter is a challenge, just like all black birds. You need to overexpose to get the exposure right for the plumage, but the surroundings burn out. I have tried to correct things in my editing, but if it had been something less movable then the right approach would be an HDR exposure. I’m coming to terms with the camera, but it is taking longer than I thought it would. The reach is awesome, but the sensor still isn’t my favourite. Hopefully I’ll grow fonder of it as I learn how to process the images it produces. Enjoy the images, and remember to click them up to see them in full-size. First some preening, then a good flap to dry off. The crested mergansers mate for life, meaning they don’t have to spend so much energy on courtship in the spring. Very attractive birds they are.